ACEN APPROACHES - See you in a Week! Well, it's that time. I'm finally finishing up all my products, signs, and whatever miscellaneous items I have left to do. That means I'm going to be really really busy the next few days. ACEN is still technically the "largest" show I go to all year, as well as being about 3 weeks way too early for me this time, so I have a lot of things I'm finishing up. Not frantically rushing, but certainly making sure I have everything covered. I should probably make sure I stay focused and not get too distracted by blogging or tumblr checking and the like. So for now, I shall bid you all adieu and see you in about a week with my recap for ACEN. Are you going? Well, if so, come see us at BOOTH 104! 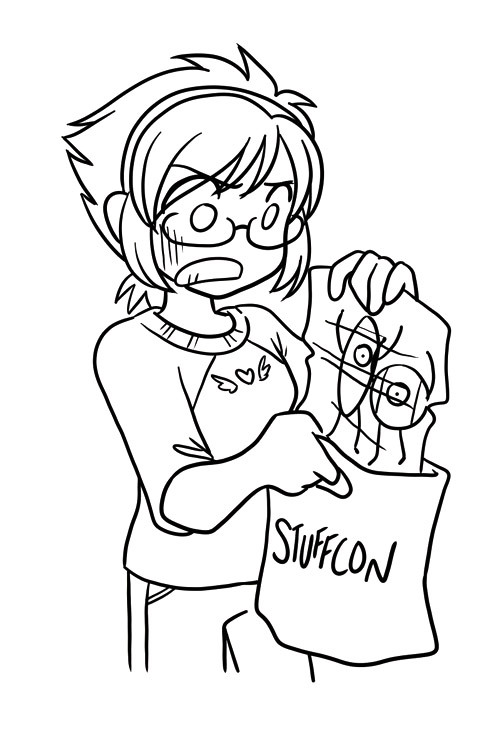 It's that time - the last week before ACEN (OH GAWD), and as always I'm rushing to make sure I have everything ready. Been working on a ton of new things (including the same ol' badge sets too!). Probably my favorite of my "complete sets", a.) because I love the game and the show, and pretty much everything about it, and b.) It's finally COMPLETE. Well until I decide to draw all the bad guys, then secondary characters, but let's not worry about that now. Fun Fact: Background is based on the in-game menu! Total set of 8 buttons. Let me tell you, this one was the start of my "button set" mania. I really liked how it came out with the custom insert, and the fact that I can program my Cricut machine to cut all these out (and the holes to stick the button backs into) FOR ME. I literally just load the paper, and go "CUT MY STUFF" and it does. It's amazing. Total set of 8 buttons, first row being from Portal 1, and the second from Portal 2, and if I am nerdy enough remembering correctly, I think they're in the order you interact with them in each respective game. (1= Morality, Curiosity, Cake, Anger. 2= Wheatley, Adventure, Space, Fact). I certainly "want them gone", but only to customers! I already made these buttons for LAST year at ACEN, but with Portalversy and the chance to design a card that looks like a test chamber, I COULDN'T HELP MYSELF. Okay, I have one other button set I'm working on for ACEN - the Mass Effect set, and should I get it done this weekend too, I'll add it on here! Here's a topic I don't see covered very often. How to actually GET a spot in an alley. It requires patience, tenacity, preparation, and reading. But it's not THAT scary or difficult - so long as you know some of the basics of how this stuff works. they most likely have other rules and such. I would assume they are similar, but I don't want to guarantee anything. Step 1: Find a convention. STALK IT. Sometimes a forum link is buried. Often it's under "Community" links, if not labeled "forums"
I don't mean follow them into a dark alley and mug them for loose change. 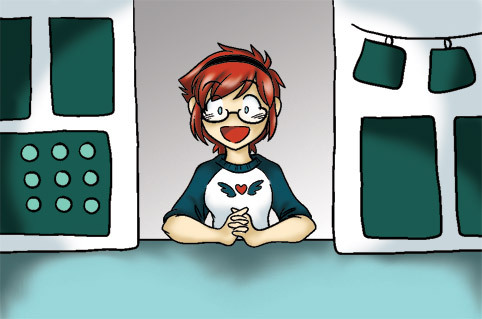 If you're interested in doing an Artist's Alley (even if you've never been to that particular show), there's one thing I can assure you: many conventions do NOT update their website in a timely manner, if at all*. *Big Show Exception: If it's a huge show, then it'll probably update. Probably. They tend to have a lot of staff. And possibly big corporation pressure. So what is a fledgling Alley Dweller to do? You STALK THE CRAP out of that convention. If it's a convention worth it's salt, there WILL be a forum. Sign up for that thing ASAP. I live on here from around December - May each year. Take some time. Peruse through the boards. Check out things like feedback boards from previous shows (if there are any), visit some picture galleries, get a bit of a feel for how the forum works. Then set up your profile with a user avatar (have a picture of your art? Here's a good place to start using it), some brief information, so you'll at least look like you fit in (instead of random newbie with no posts). 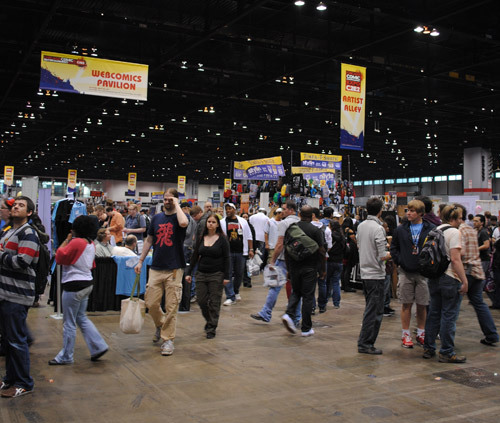 Most conventions will have a specific area programmed into the forums strictly for Artist's Alley. GO HERE. Start reading through things. A lot of times you might find the current rules/regulations/schedules for how the alley works. If you don't see one, then start a thread posting "When will information be available?" Mark the thread so it'll send you updates on it via email. their own sections! Take time to find it. You'll thank yourself later. Remember: be patient and polite! These coordinators usually have their own "In Real Life" jobs, and can't hang out on the forums all the time. Find out there's a mailing list? JOIN THAT SUCKER. This could be "check every day" as the date of sign up approaches (or you get anxious), or maybe every couple of days if it's still a ways away. I usually check it at least once a day - it takes me like 30 seconds to give it a glance through to see if anything's been added. Meanwhile.... Start Building a "Portfolio"
While you're waiting for all that precious information to come out, start building some products. Take pictures or scan them in. This will save you time in the long run. If you have your own website, start posting/saving your images to that site! Make your own little "gallery" if you'd want. 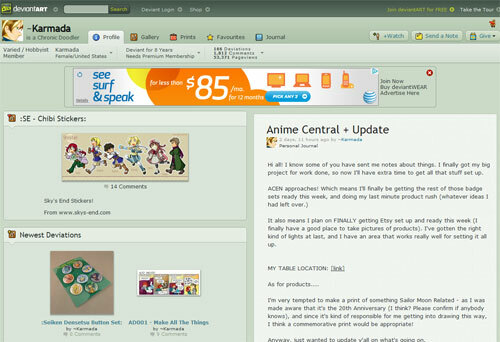 OR if you don't have your own site, you can always go to places like DeviantArt and set up an account. Add some pictures. Even the free version isn't that bad. It's a nice way to organize/store your art. And get feedback on pics and products! Why is this important, you ask? Well, now that competition is getting fierce, you need a good place to store pictures of what you make for your booth because conventions are starting to ask more and more for actual examples rather than going off of just your proclamation of "I'm a good artist, really!" Keep this page updated too. 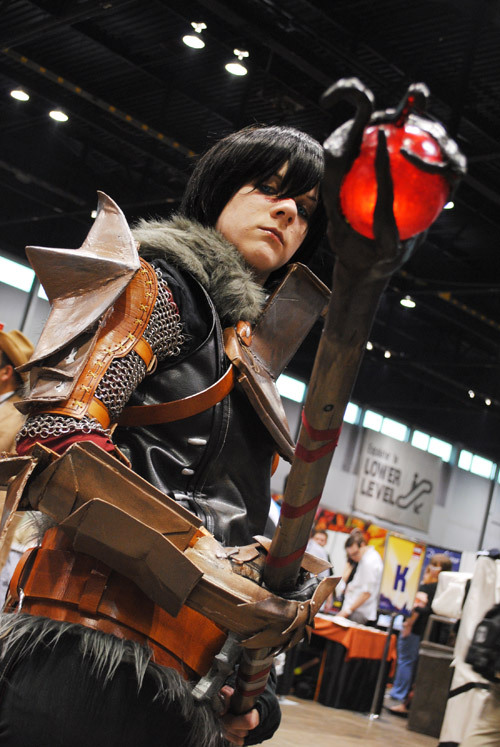 If you're lucky, you'll start building an audience/fanbase who will WANT to find you at conventions! You'll also get some good feedback on what people like and don't like. If it wasn't for Deviant Art, I might have never gotten into making Pokemon Badge Sets. TRUTH. Step 4: Read the Rules. Prepare your Paperwork. CHECK THESE KINDS OF POSTS FIRST. 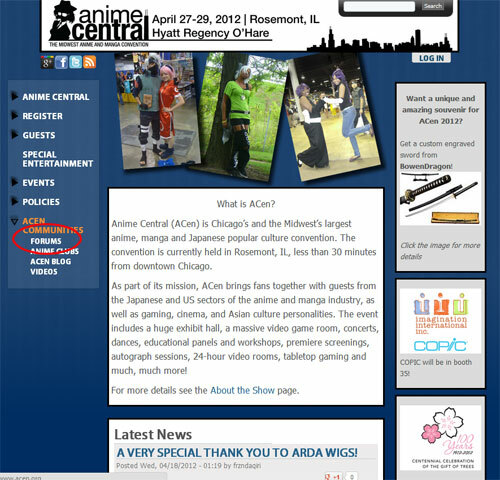 ACEN's even nice enough to provide a FAQ for artist's too. They've been excessively well-prepared this year. 1.) Artist's Alley RulesSomewhere there should be rules and regulations posted regarding the conventions Artist's Alley. Conventions will vary in their rules - some say no fanart, some say 50%, others say NO ELECTRICTY, and some are "juried" some are "first come first serve", some are a combo of both. Read through these rules. Become familiar with them. Have questions and need clarficiation - here's a great place to do it. Either reply to the post or PM the coordinator. They'd much rather work with you, than boot you out (well, most of them). Remember - the conventions aren't usually trying to steal all your money by making you buy a full badge (even if it feels money grubby). What's happened is people buy the cheaper alley badge, then don't show up at their table. Or buy cheap ones for all their friends, and none of them work the booth. It really comes down to "because people are mean, we can't have nice things". This may be nested in the "rules" post. Find this date ASAP and mark it on your calendar. That will give you ample time to get your portfolio and money in order. Sometimes forums will have a "Frequently Asked Questions" area. It's a great place to look for clarification on rules. And prevents you from asking a question that's already been asked. Sounds simple, but people forget. Make yourself a word document with a list of "items your booth sells", link addresses to your portfolio, studio name(s), and possibly your billing address (leave your credit card number off - you might not even need it if they take something like paypal). Why do you need this? Well, when you're in the throws of filling out whatever form they have online, copy-paste is your friend. The less you need to think about what you're putting in the fields, the faster you'll get through and signed up. Also, it gives you time to think about other stuff and read the form correctly. Do they have a printable contract to scan and copy? PRINT IT OUT and fill it out now. Save it. That way you just have to "attach and submit" your contract. There's really no excuse for random flailing when you sign up these days. Step 6: Wait... then POUNCE! Now it's the waiting game. You've got all your documentation ready, you just need to wait for the submission window to open. Write it down, send yourself reminders if you have to - a lot of the larger ones will give you a date and time the site will open for applications. Sit down at your computer 30 minutes ahead of time, and organize/open the needed files (make sure to get out of work early that day if it opens midday - do NOT think there will be openings 3 hours later). Pull out your credit/debit card if you need to. Have everything within arms reach. The minute that thing opens - GO FOR IT. Work fast, but accurate. You've prepared for this! Your clicking finger is READY. Double check each field you fill out, then hit "submit" or whatever the final step they need you to do is. BREATHE. You're done! It's now in the hands of the convention. When you're done, you should receive some sort of "we received your application!" message (if it's via email this may be delayed a few days). It will be nervewracking, but keep checking your email for your official confirmation. They'll tell you if you're in, or on a waitlist. In the case of an extreme wait, you can always PM the department head (DH), or send an email to general Artist Alley account (whatever that email may be). Sometimes alleys take a LONG TIME to get back to you - most are pretty timely and can get back to you within the week. Are you in? AWESOME. Go start making things, or stalk your next alley. Are you on a waitlist? DON'T FREAK OUT. Things happen and artists have to drop out. You may still be in the running - so start making products and looking for other alleys to be in. It's not the end of the world. I know this list seems awful long, but every convention is different. The best thing you can do is BE INFORMED. Claiming ignorance is no longer an acceptable excuse as many conventions put this information out in the forums WAY before the time to sign up. Signing up for an artist's alley spot is a lot more complicated and competitive than it used to be back in the day - so knowing how the general process works will keep you ahead of the game! Anime Central's 2012 Artist's Alley filled up with applications in 12 minutes. 12. I was done 6 minutes in, only cause I forgot I had to log in first. I almost missed it due to my own negligence in reading the rules. 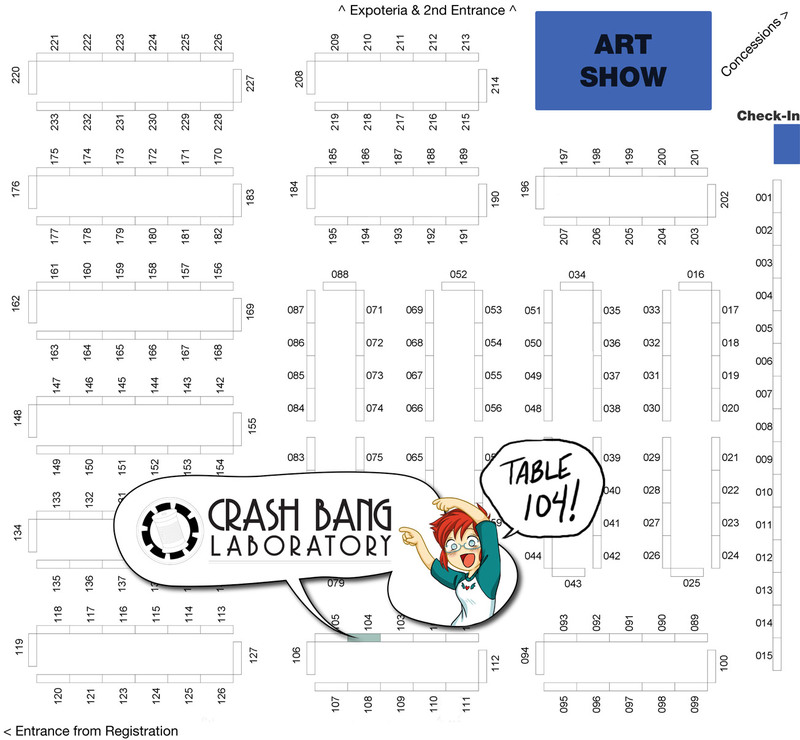 How to Artist Alley: Booth Essentials UPDATED! Time to take a break from talking about products! (Don't worry, we'll get back there soon). I'd like to spend a post and talk about all that OTHER stuff you'll need for your booth. Not packaging, not booth set up, not products, but all those little random things you don't think about but couldn't live without. I'll be honest. I often forget about these kinds of things until the day before (two if I'm smart). So instead of freaking out and trying to put all this together at the last minute, I'm presenting you with a fun list of things you should probably work on eventually collecting for your booth. The goal is to not spend a fortune on stuff, but do understand these kinds of things are more like an "investment" and if you're in it for the long haul, you'll want to get good quality versions of these essentials later (as the need arises). They're pretty easy to locate. Make sure your box is lockable with a key. This is mainly for money safety - if you need to get up, look away, and/or not be within the vicinity of your box, it should be locked. This is also important if you are sharing a room with other people. Always take the Cash Box back to your hotel room each night, and keep it locked unless you're counting/sorting what's in there. This prevents any issues and possible thefts. While not an absolute requirement, I strongly recommend having a Cash Box with a removable tray (and thus having space underneath it. Why is it important? Well, it's to give the illusion you only have so much cash in the box, and it will protect large bills. If anybody gives you a bill bigger than a $20, it should go INSTANTLY underneath the tray. Also, try to avoid keeping more than a few 20's on the upper tray too. If you end up getting a lot of 20's, store them underneath the tray. The less people see in your box, the less likely you'll be a target for theft later. Note: I've never had a problem but I am also super protective of my cash box. Always have a set amount of cash in your Cash Box before the convention starts. This way when they all walk in with $20's, they can actually buy your things. That will at least give you SOMETHING to work with change-wise on Friday. Do NOT assume that people come loaded with $1s. You can separate it per day if you want, I tend to just keep one, and keep a running tally each day - writing it on the front. Better than a bunch of bills flying around your box. 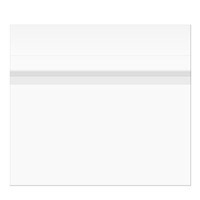 ALSO - if you are not going to get a heavy duty locking box, then envelopes are a must just for organization. They can be the cloth ones or just paper ones. Up to you. I don't have one yet myself (I should though), but you can get them at office supply stores. Prevents getting bad bills. Not that I've ever had a problem, but it's wise to do for things like $50's or $100's. C'mon. No need to be boring. Jazz it up! It's like your little personal space at the booth, make it pleasant to look at when you open it up. 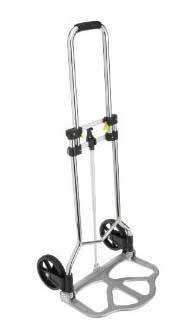 This is known as a Folding Hand Truck or Folding Hand Cart. Why is this a vital piece of machinery? Because gravity is a cruel mistress, that's why. Actually it's because OUR BOOTHS ARE HEAVY. No kiddin' folks. Once you put all your booth into a few boxes, each of those boxes will weigh QUITE a bit. Oh sure, you can lift it from the car to the floor, but try carrying that box (or two) from the parking garage through the habitrail, across the street then into the hall where you have to wait in line. Then haul it to your booth. do you REALLY want to be lifting it for that long? Oh and don't forget. If you couldn't carry it all the first trip, you have to repeat that trip as many times as you need to get all your boxes. Or you can be lazy, and buy one of these! With a hand truck you can load up a few boxes, frames, wire panels, you name it, and use gravity and simple machines to get your product where it needs to be with minimal effort. And doing this multiple times is much easier than multiple trips (or conning several friends into hauling things for you - I did that long ago). Make sure that it folds too - why, you ask? Well, it needs to fit in the car somehow, and the smaller the better! You can find folding hand carts/trucks at local hardware stores, sometimes office supply stores, or more likely you'll want to order online. If you're super lucky, you'll find them at garage sales for super cheap. Just make sure they can handle the weight you're going to toss on em. Anything that can "hold" something is prime target for being a trash can. Don't let it take up too much space, but don't leave home without SOMETHING to toss stuff into. Just make sure it's a decent size that if you had to crumple up things like paper or put a few used bottles or cans into it'd fit with extra space. but they come in all sizes. As fun as it is to throw away all the old cardboard boxes after you sell all your products, you're still going to want to invest in some good plastic storage for those items that you'll still have after the con (and take with you time and time again). These boxes will be there to store display parts, cash box, leftover products, supplies (like button makers and parts) and more. I strongly recommend finding the types of boxes that latch on the sides, as they are the easiest to move around and the tops won't pop off during transport. A lot of conventions lack free, easy to get to electrical hookups, so you either purchase it separately, or pay to use one that's already set up. Whatever the case, ALWAYS bring an extension cord and/or a power strip. Just because you ordered power doesn't mean they're required to help you get it to your table. An extension cord will allow you the freedom to be "sort of close" to a plug rather than required to be directly next to it. 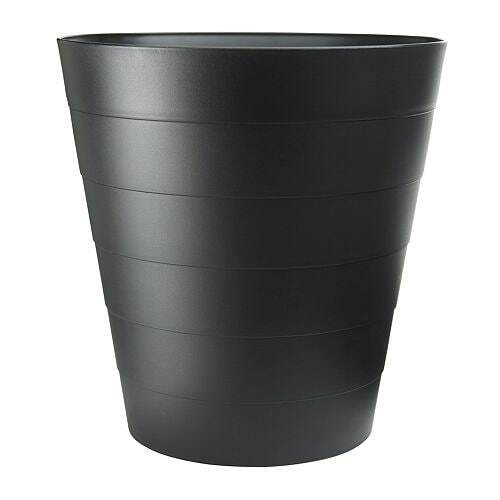 Yet another item you can find at Ikea. For the love of all that's sacred, find a way to slip a pillow or seat cushion into your booth products. You probably don't think about it, but most places have standard metal folding chairs. Then think about the fact that you'll probably (or at least should) be at the booth for a good 8+ hour day. That's a lot of sitting on an uncomfortable chair. Bring a pillow/cushion to make it easier! Your body will thank you. Sounds silly, but I'm putting it in here anyway. If you're like me, I get so hyped about working, and into the moment I forget about things like food or eating. Heck, I'll forget to drink water and then wonder why I'm dehydrated! To prevent unwanted dehydration and/or starvation pack non-perishable items like crackers, granola bars, breakfast bars, fruit snacks or whatever floats your boat that's not real messy. You want them to be small, bite-size, something you can eat fast in case you need to talk with a customer. Also make sure to pack a couple of bottled waters for yourself (they can be refilled easily by drinking fountains), and maybe a juice or two. Keep em under the table, so that way you won't have to wander too far if you get hungry. You'd be surprised at your need for these. I'm so ashamed I forgot to put this on the list at first! This is one of the more lesser thought about, but vitally important items for your booth. What are they used for, you may ask? Well, so glad you did. Bedsheets like these are used to drape over top of your booth when you are closed (either during the day if emergency calls) or at night when your booth closes up. I know, a lot of conventions will have "closed rooms" that the alley will be located in. That's NO REASON to think that you don't have to worry about safety. It's always a wise idea to cover up your booth to deter any would-be thieves. The more effort they have to go through to see/get to your stuff, the less likely they'll try to take your things. I've never had a problem, but I've also thoroughly covered my booth and removed all the expensive/vitally important items every time. You don't need to spend a ton of money on these. I highly recommend going to local goodwill stores, asking relatives, or if you must - visit discount stores and find the largest bedsheets you can. Just the flat ones. I strongly recommend getting king sized, and getting at least 2. That way, if you have a taller display, you'll be sure to cover the whole thing. Also, in a pinch, they can be used as decorative tablecloths! Just because you're having an artist's booth doesn't mean you should only think about your products! A booth will be like your "store" and every good store needs a good infrastructure to back it up. Keeping yourself organized and comfortable will make your Alley Dwelling a more positive experience! NEXT UP: We're going to be discussing how to actually GET a spot in an Alley. You know, how the general sign up process works, and what to expect. I am taking a break from my "How to Artist Alley" features to talk to you about a random convention that appeared this weekend. Well, okay, I knew about it a while back, but then stopped thinking about it until the other night. But enough about me, this is about spontaneity! So the other night, after yet another break down (yay.) I lamented that I felt stuck, like I didn't know if what I was doing mattered. I offhandedly mentioned C2E2 (Chicago Comic and Entertainment Expo), and Dave was all, "Oh? what's that?" Me: "Oh, it's like a comic book convention that's in Chicago. I keep forgetting about it. It'd be awesome just to visit someday." Me: "Oh the usual - a big dealer hall, and a HUGE artist's alley, and a bunch of media people and companies and things. 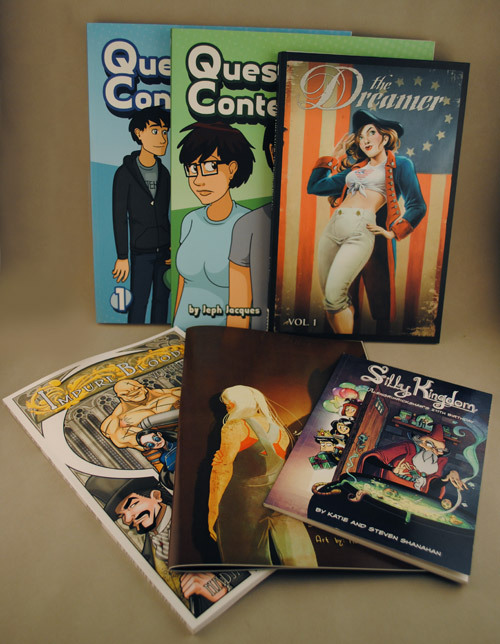 With the regular comic book industry, not like anime." Dave: "So... this would be a good place to network and learn what's out there on the other side of the art world?" Me: "I guess so! Their alley list is huge, and a few of my webcomic artists that I keep track of will be there. I'd love to meet them." Dave: "Okay. Let's go then." Me: "Yeah... what are you doing?" Dave: "I just bought us tickets. Let's get a housing spot so we can visit for a day." Me: "WTF IT'S LIKE TOMORROW"
Dave: "I guess we'll leave after work then." And that was how I ended up in Chicago for a day on Saturday. 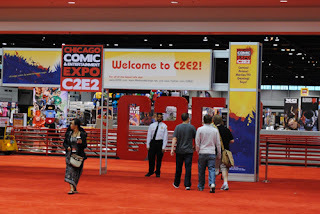 And thus begins my C2E2 recap! I had no idea what I was in for. 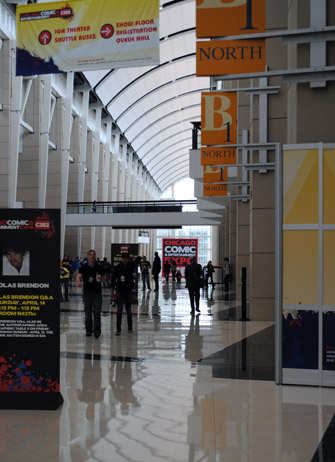 After a lovely 5ish hour drive over to Chicago in the late evening hours, we arrived, slept, woke up and drove over to the convention center. Now this convention took place in the McCormick center (I'm used to stuff being the Rosemont Center), so naturally I was in for an adventure. We got there really early (okay, early on Chicago/Comic Convention standards. We didn't have a lot of time to adjust to being 1 hour earlier). So when we got there, it was pretty desolate. The registration booth was empty, and we just walked up and handed them the barcode, where they scanned it, then gave us our tickets and we were on our way. Well, we had to wait for the dealer hall to open. View down the hall in the McCormick center. One of the main entrances. They had us go through the side. So we waited for a while, and chatted it up with a gal we knew from AWC (I'm sorry I'm so bad with names, I knew WHO you were, I just can't remember names AUGH). Oh, and I had a starbucks coffee to start the day. YUM. I'd need that caffeine boost later. During that time, I ended up buying myself a new hoodie with the convention logo on it (so I'd have "geek cred" in saying "I was there!") and got myself a picture with a storm trooper. What? I'm not in cosplay? Since it was such last minute stuff, I didn't bother bringing a cosplay which is weird for me. 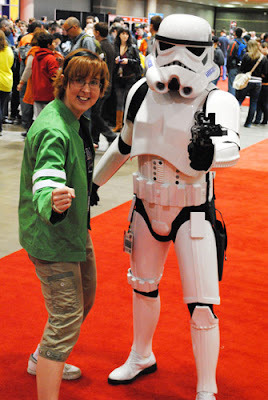 I did bring the Ben Ten Jacket and wore that around - I was certain it'd be chilly with A/C on and all. And I was right. This is maybe the width of a 3rd of the alley. I did a lot of browsing at first, picked up a couple of things I knew I wanted, then we went into the dealer hall area. Lots of shopping to be had, but alas, not much I would want (I'm not really a comic book collector) but there were some really neat areas. 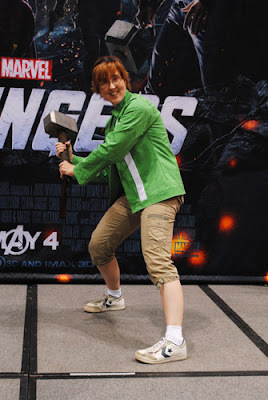 They of course, had an Avengers Movie promotional area. And they let us take pictures with either Captain America's shield or Thor's hammer. You can all guess which one I took. I was on the prowl for costumes, since I was photographer this time, instead of cosplayer, but I did not see many at all. And that made me sad. So should we attend next year (It looks likely, and I may very well aim for the Alley - I'm going to see what the rules are), I plan on upping the bar with some costumes. Her staff lights up. It was awesome. I ended up leaving around 4ish because I managed to twist my ankle or something that made it near impossible to walk around without intense pain. But it was WORTH IT. I had so much fun talking to artists I've only seen their work online, and I got to shake their hand and tell them they're awesome. My only real gripe with the convention was that nobody here seemed to understand common courtesy. I know AnimeCons are notorious for running screaming fangirls - so I hide behind my table for the most part or know to dodge appropriately. Gencon has always been uber polite so I never had too much of a problem (even in crowds). But here? Apparently nobody understands an "excuse me" and that it's dangerous to go randomly bumping into people. I'm fairly certain this is how my ankle died. So next year, if I have to rove the hall.... I'll certainly know what (not) to expect from people. Anyway, I'm not usually one to do that "take pictures of my stuff and post it for everybody to see" but I just HAD to in this case. Being an Alley Dweller myself, I was most definitely impressed with how the booths worked in this alley (MUCH different than say an Anime Con artist alley. And if anybody wants to know my thoughts, I can definitely spend a post talking about variations and the good and bad of both). Every business card was different (no VistaPrint templates THANK YOU!!) and some of them got creative. 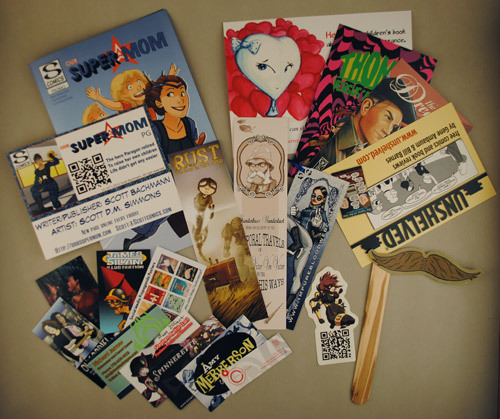 I got bookmarks,postcards, QC codes, a free 2 page promo comic, and yes, a mustache on a stick (his info was on the backside). And they were all FREE. Like, just handed to me when I walked up. It made finding people SO much easier later, and I knew exactly what their booth did. Needless to say, I loved my little collection of swag. Now onto what I bought. That red print makes me laugh so much. I call it the "derp face". It will go up in my artcave. I got to meet some very lovely artists, and had a fabulous time talking with them all. I hope I didn't fangirl too much at you guys, cause I was really practicing my restraint. Thank you for letting me tell you you're awesome. And thank you indie artists who I didn't know about until I went there. You guys were awesome too. It really expanded my vision art-wise and I am REJUVENATED. I picked up a total of 6 books (only one of them was a single issue like print). I can't wait to read through them all! There were more books I wanted to buy, but I was too poor to. SAD. But next time I'LL BUY MORE. I had a fabulous time, asides from the awful foot pain, and I'm fairly certain I'll go back next year. It was great seeing all the different kinds of artists that were out there and they all really inspired me. They also helped me in realizing, I'm pretty much THERE when it comes to my art, and I'd be a competitive force in the arena. Just need to build up a decent portfolio - so here's hoping the inspiration keeps up (and my hand works) and I can find a way to fight back the tiredness after working full time during the week. Thank you C2E2, and see you again next year! I originally had this as part of the "Products" posting, but decided that it needed it's own spot. A question I see a lot on forum boards is "How much should I charge for my products?" This is a really hard to determine category, because in all honesty, this will be different for every person. Not only does it have to do with the cost of materials and time, but also includes your reputation as an artist and your personal abilities and perceived level of skill. a.k.a. How can I make back my booth fee? I talk a lot about how your booth is your "extension as an artist" and that "you're not going to make a living solely off a booth like this" and other random idyllic-sounding phrases. And I do mean every one of them. But we also need to face the harsh reality that if you're not at least making back your convention fees, you are just throwing money down a hole. And that's just silly. Art prices have always been a touchy subject for artists and patrons alike. The buyers want things as cheap as possible (it's so easy for you to make!) and the artists want to charge for their time and experience (It took me 15 hours to draw the original!). So the best we can do is to find a happy medium in the convention world - don't overcharge, but don't shortchange yourself. WARNING: Convention Artist's Alley Pricing will end up being DRASTICALLY LOWER than if you were in an actual art show with actual prints from a high quality printer that big giant professionals use. Just getting that out there right now. So if you're thinking that you want to start charging the prices you see artists at local art fairs charge.... you aren't going to sell a thing. Unless you've already got a huge following and reputation. One of the first things you can do, it at least get a feel for what Artist's Alleys tend to sell at. Before deciding to jump into this, take a look around a few. Make some notes, talk to the artists, and analyze their own prices. Is that something you'd pay? Or would you want something lower (rationally)? I will continue to emphasize: BE HONEST. as you can see, most of these are standard US bill denominations. Why do they work so well? LESS THOUGHT INVOLVED - they don't have to count a bunch of bills - they just pull out a 5 and call it a day. I have found that $25 tends to be the limit on an item, unless it's big and you can describe as an artist why it costs so much. If you can justify the price, the customer might buy it, otherwise, it's getting into expensive territory and unless you have a good rep, they won't pick it up. Also - people love a deal. If you can say "get TWO for.." or "Buy X and get a FREE one!" they'll probably be apt to figure out what else they want to buy to get the deal. Example: my little buttons are $2 a piece, but you can get two of them for $3. So How Do I Determine a Price? It's tough. I'm going to admit right now that I'm not going to give you an easy or direct answer. It's something you must determine for yourself. But I can at least give you the factors I keep in mind when I start coming up with a price, and at least describe what each one is. This is probably the easiest to figure out of all the factors. You save your receipts, and then take the total cost and divide it by how many items you made with it. It's a little more difficult with fluid materials like paint, resin, general art media like markers or pencils. Those tend to be.... negligible. Each math'll be different, but I wanted to point this out to you. ALSO: include things like packaging in "Cost of materials". If you can determine the amount it costs per item, that gives you a minimum you should be charging. On a side note - it's also best to work up to the quality level of your supplies. An example I see a lot of is with jewlery (steampunk or otherwise). They'll put their pieces together using premium gems, stones, antique pieces, and crystals - which is great and can definitely make things look better - but I'll find they just string em on a strand like regular beads. They're not focal points, or add to aesthetic quality of the piece. They look like they're there to add money (and often are advertised as such). So think about your quality of materials vs the final product. Does it look like it can carry the name of whatever brand your using? How long does it take you to make these items? Remember when I talked about getting familiar with making your products? Well, here's where it's vital. Now, is this a product that takes copious amounts of work - or is it something you make in like 30 minutes? If it takes you hours, then $5 for that item is probably a bit too low. Just sayin'. Be honest with your work, and learn to work efficiently so you don't feel like your shortchanging yourself. Also, if your product is taking you days to make.... it might not be the best idea for a product. Unless that's the kind of products you're advertising. Chances are likely that there is a more efficient way to do what you're doing. 1.) There will always be somebody better than you. Learn from them. 2.) There will always be somebody worse than you. Help them. This does not mean that you walk up to a artist better than you and demand they tell you how they made their artwork, nor does it give you a licence to walk up to a "worse" artist and start critiquing their work. That's a fast way to get labeled a jerk. What it DOES mean is that you should make friends with artists of all levels and through your camaraderie, you'll all get better. BUT I DIGRESS. Note: You may start off with one style (we all do, really), but the more you draw, the more you experiment, and the more unique your style gets. It's really just about how much experience you have. Are your lines and/or colors crisp and clean to your particular style? - Are you consistent in your art style? Do they all look like they came from your hand? Do they look like you are "confident" or "comfortable" in using that media/style? . Then you'll also have to deal with picky customers who want to root through EVERY PRINT YOU HAVE to make sure they're buying the best one. This is a grand pet peeve of mine - so if you keep it consistent, they can't argue with you about it. I just tend to emphasize 2D cause I draw. If you're a relatively inexperienced artist, it'll probably show. So where you might want to charge $10 for that 8x10 print, you probably won't sell it for that much. (I made this mistake back in the day). Something like $5 might fit better for a lower level of skill. I'm NOT saying that if you're inexperienced, don't enter. NO. What I AM saying is that you'll need to realistically price your products. Getting them to move off your table is the first step to building an audience. This usually comes into play after you've sold your products at least one convention. How quickly did they move? Do you want to make tons of these all the time? Was the price worth your effort? The more people want a product, the more they'll probably be willing to pay (within reason), this also goes along with the better quality, the more they'd be willing to pay. So you have to think, "I just sold 10 of these in 30 minutes. I might have priced it a little too low" OR you may go "I made 30 and have only sold 3 between 5 convention trips. I think they're too expensive." It takes a few trips to hit that sweet spot. Do you have followers? 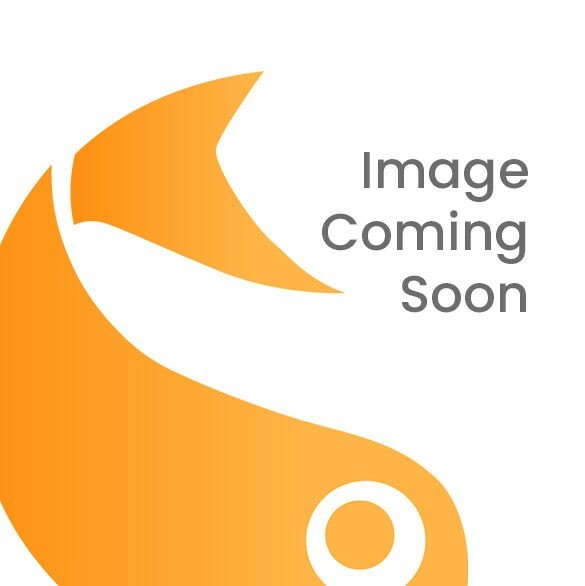 Do you have books published? These are just a couple of items to think about for this category. Now, it's not giving you a license to gouge them (that's just awful), but you can certainly charge higher rates for your higher level of popularity. It's kind of like getting a raise at your workplace for being there for X number of years and proving your worth. Do NOT, I repeat, do NOT change your prices repeatedly throughout the day. you may get angry customers demanding their extra money back. The last thing I wanted to talk about was commission pricing. Many artists will have "on-the-spot" commissions. This could be custom buttons, badges, keychains, whatever. This is where you can really get burned if you price too high or too low. RULE #1 - Have a limited number of "commission spots" available. Unless your commissions only take you an exceedingly SHORT amount of time (custom buttons, photos, ID cards, etc) you're going to need a sign up list. Be realistic on your speed, and always always underestimate how many slots you want. Better to shoot lower and go "You know what - I CAN fit you in today" rather than have to say "Oh I'm sorry, I'm overwhelmed. See you next con"
You want to get things packed up this day. The LAST thing you want to be worrying about is finishing commissions in record time. You want to make your effort worth your time. If they don't want to pay you, and then you spend your time drawing, and then they don't come back, that's a commission slot you could have given to a paying customer. I've never had a problem with it, but I figure somebody has somewhere. I've made this mistake so many times. By having their number, you can call (or text with permission) to the customer when their artwork is finished. Much nicer than them coming by every 2 hours. Have a form, if you want to. I think I'll be making one myself. Just because somebody wants to throw money at you to draw Superman and Batman kissing in the rain, doesn't mean you should. I strongly encourage having disclaimers listed by your commission prices/examples - because then you won't have to fight off people. If you're not comfortable drawing it, TELL them that you can't, and that you're sorry. I also have the rule that I won't do a commish unless they provide me a reference (unless it's something super well-known). I seem to have the knack for acquiring the commissioners that want pics of stuff I've never seen, can draw, or even remotely relates to my artwork I have up. Similar to the "don't draw what you don't want to", you need to set restrictions on what you're drawing. Are you doing busts? Chibis? Want only 2 characters max? PUT THIS IN WRITING. A lot of times, I'll have the 2 character max rule, but if you MUST have more, I add $5 per character. Otherwise, you'll get people wanting you to draw the entire cast of Naruto for $20 and refuse to pay extra. NOT COOL. Now what about the money? Well, you want to make it worth your time, and worth the commissioner's cash. So first off, I'd say set the prices higher than a standard print of the equivalent size. Why would someone want to buy a print when they could get a custom piece for the same price? THIS is why you price it higher than those. Secondly, price according to your skill level/reputation. Are you popular? Do you get a lot of requests - hike that price up a little more. This is to prevent you from having to turn away too many people. It also makes your time more valuable and (especially if you have a set audience already), they will appreciate the time and work you have put in. If you're a beginning artist, you'll probably charge a bit less than regular commissions. I also recommend drawing on a smaller surface, like 5x7 or 8x10, rather than large art papers. This will help you work faster as well. I have tendonitis, and inking a picture is what destroys my arm. So, I have my commissions set to a comfortable price and size for me to work on easily (everybody likes getting colored and inked images) that won't kill my arm. Currently I usually do 5x7, pencil for $8, ink for $12, full color for $15. If they want a bigger size, that price goes up. I'd at the least price an 8x10 full color image at $25-30. I tend to fill most of the page and at least add a swatch of background color. Pricing is hard. You're gonna go through a few conventions before you find your optimal pricing and a good commission rate. The best thing you can do for yourself is ask the question "What price would I buy this for?" and be as honest and blunt as possible. I know it's tough thinking about devaluing your work, but you have to think like an attendee, not necessarily as an art expert. What's an Artist's Alley booth without products to sell? While I may spout my ideals on "Doing this for the art", it's also sensible to know that you'll have to make back that booth and hotel cost somehow! For some of us, choosing what to make may come second nature. You may already have a skill or art projects you'd be more than apt to sell off. Others might be a little bit more confused or unsure. That's what we'll tackle today in "How to Artist Alley"! If you can't answer this right away, that's okay. Chances are likely that you are already a creative person, and like tinkering with things/artwork/etc in your free time. You already make things, you just haven't thought about it on a Convention Selling level yet! Please. Stop right here. Turn around. Do not pass go, do not collect $200. Before you even think about signing up for a booth, work with your idea. Play with it. Learn it, and learn to make it fast and good. Your first versions of new products will take you exceedingly longer than anything you've had a lot of experience making. Back to our original question though. Here's what I recommend: Think about what you like to do and think of stuff you'd want to find in an Artist's Alley. If you wouldn't want to buy it, neither would the customer (more on this later). Prints, buttons, and other printable objects might be up your alley. No pun intended! 3-D Artist (clay, jewelry, etc)? You will probably be making objects, wearable, collectible, displayable, etc. Do you make something unique? You might have an audience, or fill a niche nobody realized they needed! More often than not, your booth will (and probably should be) be an extension of yourself as an artist. What you sell will give customers an impression of the type of artist you are, and what your passions and hobbies may be. It's also wise to note that your booth might not be the ONLY venue you are vending in - places like Etsy or Ebay (or your own site) may assist you as well. Still confused? The only other advice I can give you is to actually visit and experience some Artist's Alleys at conventions to get a feel for the environment and type of artists you'll be "competing" with for space and customers. The convention arena is a lot different than a standard or online store. If you love your product and love making it, you'll love talking about it, and you will be enthusiastic. This will transfer over to customers you talk to, and then THEY'LL love it too (if they don't already). If you don't love your product, then who will? 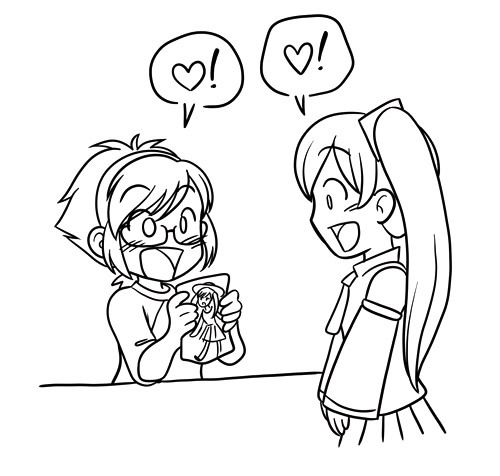 I don't know why I drew Miku in there. I see a lot of vocaloid cosplayers? I can't believe I almost forgot to talk about this. It's kind of an unwritten rule that artists should NOT directly copy what another artist does. At least, it's an unwritten rule to me. There are some products that are the same, no matter what you do - buttons, bookmarks, prints, cards, etc. Yes, they're the same item, but they'll have YOUR art on them. So that makes them unique. Don't fret here. Sometimes, "copied products" will happen accidentally. A long time ago, I drew personalized ID cards. There were other people who also did ID cards. HOWEVER - each of them were different and had their own style. Stuff like that's okay. In the end, you're better served by making items that people will be familiar with but unique to you. At least starting with these kinds of things - buttons, bookmarks, badges, etc. Also - you shouldn't be recreating things you can buy in the dealer hall (plushies would be the biggest offender here). Just not cool, and a lot of conventions will make you take them down. I honestly don't think a lot of people think about this. If you take a little extra effort and make clean, clear, comfortable products - they will sell ten times faster* than something you made the night before, half asleep. *I don't have actual stats, but I'll say they move off the shelf faster. What do I mean by clean, clear, comfortable products? Well, to understand this, one must think like a customer. What kinds of things would turn you away from even thinking about buying a product? This could be poor paper quality, damages, shoddy craftsmanship (threads, glue showing), obvious smudging of inks/colors/paint, non-crisp edges or lines.... My list could go on forever. And you need to be honest with yourself too. Be picky. Frankly, if your product's quality doesn't match the pricing your putting on it, then a customer won't buy it. No matter how "appropriately priced" it may be (though there are exceptions to this rule, you'll always find an attendee who will buy anything with XYZ symbol on it, but they're not a reliable source of income as their preferences might change with the seasons). Run tests. A lot of times the colors you see on your monitor don't always match up with the colors that come out of the printer. When you have a print ready (or several, preferably), go to your preferred printing vendor and have them print a single copy of each one. This will also let you know how the printer will handle your order when you come to get your final copies. Printers malfunction sometimes, so if the color doesn't look right, ask. The printer might even be able to give you suggestions on color formatting! Seriously. If you are selling prints, please don't make them look like you printed them off your inkjet the week of the convention onto some standard sheets of copy paper. I won't care if you made a masterpiece, I'm not gonna buy it cause it looks shoddy, and will bleed if it even gets remotely wet. Or possibly rub off onto things in my bag. This goes for anything printed. Even buttons. I print all my button images on laser printers, so that way if the button gets wet, it doesn't bleed out/fade. Find a way to store your products so they won't get crinkled, bent, smudged, or damaged in any way. What you see as a small crease in a corner nobody will see, your customer will go "NO GET IT AWAY I WANT THE PERFECT ONE". So just save yourself the hassle in arguing (or possibly haggling a discount), and keep your stuff safely organized. Also, this is here packaging comes in handy - if you can hand it to them in some sort of protective container, it'll be less likely to be damaged in their transport of it. It's amazing what a covering of sealer or enamel will do to your products. This is usually used for the more 3-dimensional items, things like sculpey clay, charms, and the like. I recommend selecting a clear gloss (most of the time), and spraying it enough to cover all the necessary sides. This will create a lovely sheen on your products and make them safe to the touch/handling as well as easier to keep clean. Customers may try to touch your products. Protect them with that glossy layer. 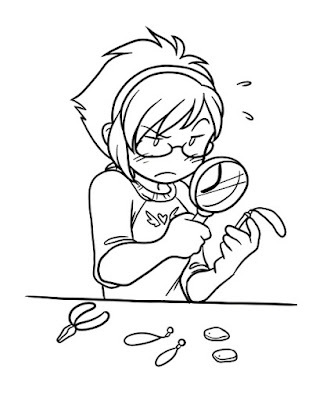 As always, test a product's gloss layer beforehand. Nothing's worse than buying a product, then having it fall apart on you days later. Making keychains/charms/earrings? Create a testing sample, and wear the CRAP out of them. Attach them to your keys, phones, whatever you intend their use to be. Treat them terribly, smash them with things, step on them... The more durable your products, the more your customer will want to come back and buy more! Don't let this happen to YOUR customers. If you've spoken with me, you'll know I LOVE packaging. Packaging not only serves the purpose of protecting your product from the standard wear and tear in an attendees bag, but it also helps make your products look professional and that you care about them! It's a wise idea, once you've created your products to figure out how to store, display them, or how they will be handled by a customer. My biggest gripe here is with prints. So we'll start with that topic. Are you selling prints? Please invest in clear sealing art bags and backing boards. Has a peel and stick section on the bag itself so your art won't get stuck getting it in or out of the bag. Also prevents smudging, getting wet (for the most part),or ripping in somebody's bag. I strongly suggest, nay, demand you get these too. If I could demand any sort of mandate in the alleys, it would be backing boards (or something similar). These are pre-cut matboards in specific sizes that you slip in behind your artwork when you put it in to a protective bag. This prevents the artwork from getting bent, crinkled, crushed, you name it - because you know they're just gonna shove your amazing artwork into a bag. They don't have to be the ultra fancy type, nor are they overly expensive: You can get 25 - 8x10 sized boards for $4.50. If you're matching your number of plastic bags, then that's only $18.00. For a grand total of $27.50 you'll have a ton of packaging, and make your prints look IMMENSELY better and professional. And your con goers will be pleased their art is not being crushed. Think about how you want your customer to see, and/or carry your product. They sell earring cards and jewelry cards and tags in craft stores now (along with neckforms and the like), and plastic locking craft bags are easy to come by (and cheap) and can help protect your products. I'll stop before I have a 3-page dissertation on packaging, and I'll save that for its own post. Later. Your booth can really be anything you want it to be, obviously within reason. Be creative and courteous! (Friday) we'll talk about Pricing. I originally had it tacked on to the end of this particular blog post, but then it turned into a small book, soooooo it gets it's own post! NOTE: Sorry for the late posting - I wanted to add my little pictures (even without the color at first), and I got caught up finishing a project for work. Okay. As I'm writing these up, I realize I am packing a TON of information into each of these posts (otherwise I'd be posting for months). THIS IS NOT TO SCARE YOU OFF. I love greeting new artists to the alleys - I like making new friends and seeing them succeed! Consider these posts like chapters from a book, for lack of a better term. You'll want to refer to the bits and pieces that fit what you're looking for. You might not even agree with all of my advice. THAT'S OKAY TOO. In fact, if you've had an interesting experience that affected your alley work (good or bad) you can let me know! I'd love to hear your experiences or advice you might have for others. You can always send an email to crashbanglabs@gmail.com. It's also wise to note that you're NOT going to accomplish all these things at once (if you are, please toss a bag of money my way!). You'll eventually have all of this stuff over time - like products, booth set up, packaging, etc. You'll probably want to start off with the topics most important to YOU to start with. You might already have extra booth parts from a friend or work or wherever, but never thought about packaging. You might have all your products, but no clue how you want to display them. I merely want to provide a REFERENCE TOOL for us Alley Dwellers. I'm a forum lurker. I'll admit it. 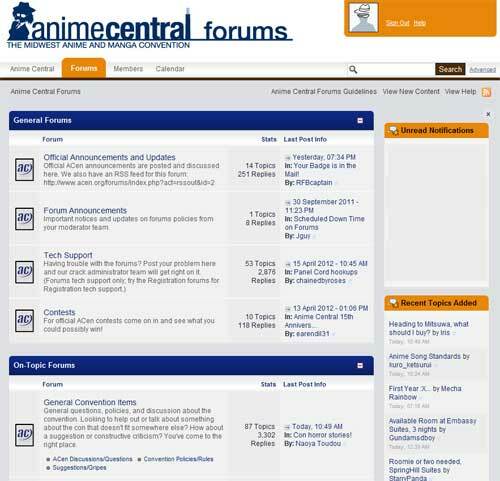 I like watching the forums to get an idea on the atmosphere of a conventions. To me, the more active a forum is, the better involved the staff and attendees are - everybody's in it for the long haul. 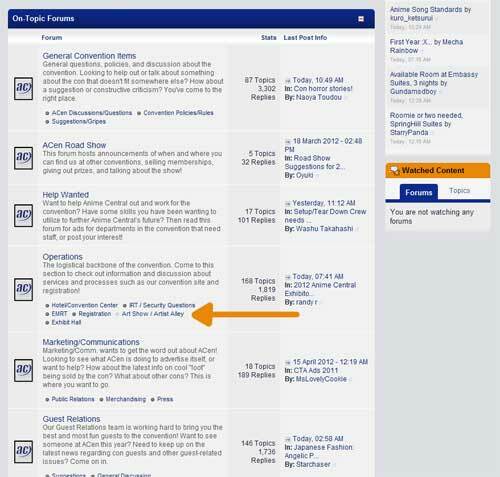 It's also a great way to meet people, learn immediate info and the like. But what does that have to do with the title of the post? A whole lot, actually. Lately, I've been seeing a lot of "I've been thinking about joining the Alley. How do I do this?" 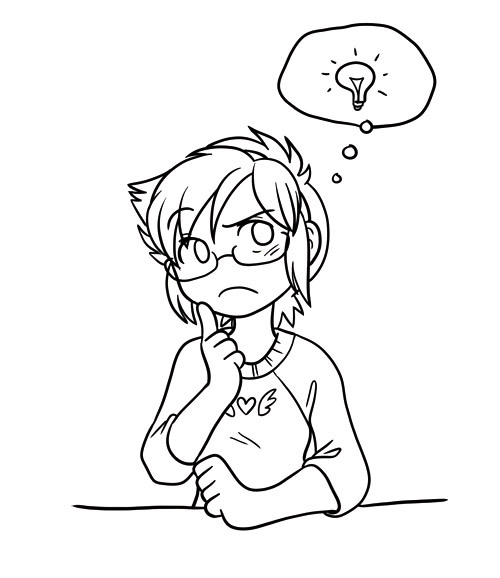 So I've decided to spend the next couple of weeks amassing all of my personal experiences, and possibly the experiences of others in "How to Artist Alley". Sounds fun, right? Right? Anyway, there is a LOT of different things that go into having a booth in the Alley, and it can seem EXTREMELY overwhelming. I'm hoping to alleviate a lot of that through these posts. With that said, let's begin! A.K.A. Just what am I getting myself into? This is how we all look on Friday. What IS an Artist's Alley? The "Artist's Alley" is a sectioned off area in a convention (usually located near the dealer hall), where "amateur artists" purchase table spaces and use it to sell their own personal creations. What sort of things CAN I sell? If you can think it and make it, there's no stopping you. The more unique your item is, the more you'll stand out. Now don't take this as "you can't do what everybody else is doing" - just do it with your own twist! Really, the sky's the limit, don't restrict yourself to just this list. What sort of things CAN'T I sell? You can't sell off old merchandise (figures, etc) you own either. The Alley's not a garage sale, thanks! Also! Don't directly rip off a fellow Artist's ideas. It's just common sense and courtesy. Sure you may LIKE their products, but it's not fair to you or them if you create unfair competition by replicating what they do with minimal difference. If you respect your other Alleymates, then they'll respect you, and you'll make TONS of new friends. What about Fan Art? I'm gonna talk about that in it's own post by itself. It deserves it's own spot, so hold on, and wait for that to show up next posting. Can you make a lot of money doing this? How much do you make? 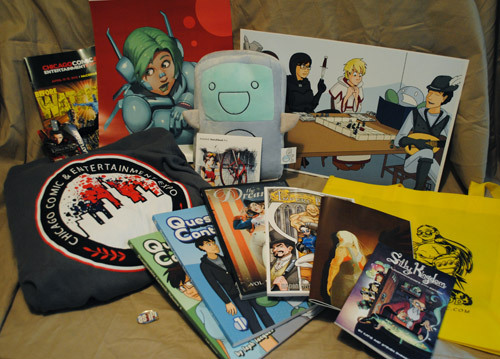 To me, an Artist's Alley booth is an extension of your art and promotion - it's not soley there to generate cash. The minute you start treating it like a money flow, your products will take a dive. Trust me. But I'll also give my dissertation talk on this later. It's more about getting your name out there, and networking than anything else. What other topics are you going to cover? Fan Art and the Average Convention Attendee. Surviving the weekend at your booth - and how to sell everything you have! Okay. Maybe it'll just be the feature until I leave for ACEN. Hahahaha. I have a lot more to talk about than I thought.